Muffins are great, but it's frustrating when they get stuck in the pan. The trick to preventing muffins from sticking to the muffin tins is to grease each muffin cup thoroughly. When it comes to greasing muffin tins, you have many options. All of them are easy, and which you choose will depend on the material of your pan and the ingredients you have on hand or wish to use. 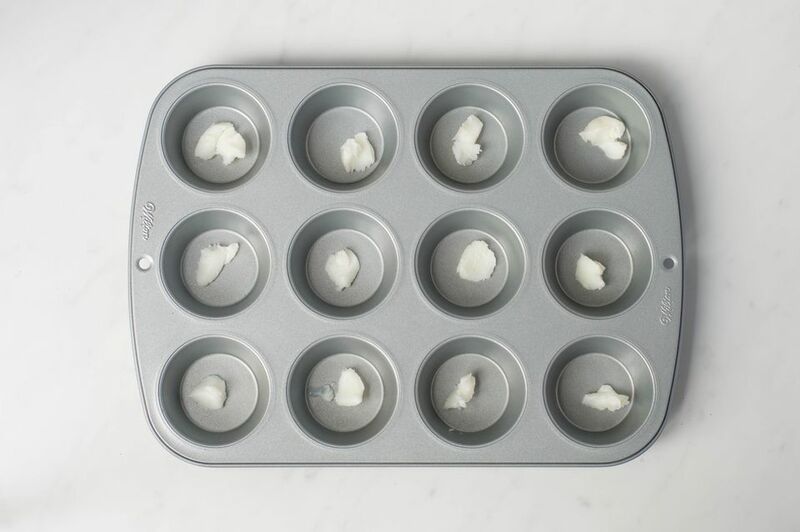 The easiest way to grease muffin tins is to use melted butter and a pastry brush. No pastry brush? Wad up a paper towel and dip it in the butter or designate an unused and washed paint brush (a 2-inch brush works great) for use in the kitchen. Melt a small amount of butter in a saucepan over low heat. After the butter is melted, remove from heat. Dip a pastry brush into the butter and use it to lightly coat each muffin cup. Make sure you get the bottom, sides, and corners of the cup. You should only need a tablespoon or two of butter for 2 to 3 muffin tins. On the stove, turn off the heat once the butter is partially melted. It will melt the rest of the way from the leftover heat. In the microwave, melt butter in 5- to 10-second intervals and check the progress in between. Depending on the amount of butter, it should not take longer than 30 seconds (and that time is for a lot of butter). Cooking Spray - Vegetable oil sprays are a popular option for greasing baking pans and it will work with muffin tins as well. The trick is to ensure you evenly coat the sides of each cup without getting too much spray built up in the bottom. Olive oil spray can be a healthier choice to traditional vegetable oil sprays. Shortening - Shortening is easy to spread with a pastry brush or paper towel and it ensures the same even coat you get with butter. Unlike butter, you will not affect the muffin's flavor. Liners - Paper and aluminum liners are a popular option for muffins and cupcakes. They make handling the finished baked goods more sanitary and are often preferred if you're taking them to bake sales or some other communal gathering. Some bakers prefer to spray the liners with cooking spray as well. Other bakers don't like the finished effect liners have on their baked goods. Parchment Paper - An alternative to liners, cut 5-inch pieces of parchment paper and push one into each cup of your pan. The excess paper makes removal easy after baking because it can simply be lifted out. This may not give you the perfectly round shape of the tin, but it does have a nice look that can actually dress up the average muffin. Professional Baking Grease - Available at cake supply and many online stores, you can always turn to pro baking grease for your muffin tins. It's also very easy to make yourself: mix equal parts shortening, flour, and oil until light and fluffy. It is generally advised that you do grease all of your baking pans, though there are some types of pans that may not need the extra help. Standard Metal Pans - Always grease metal and glass pans, no matter the style. Non-Stick Pans - Even though they say 'non-stick,' many do require a light greasing and it will vary based on the manufacturer. Silicone Pans - These may also require a light coat of grease. Be sure to place the muffin pan on a cookie sheet for stability. The small cup size can make removing your muffins, cupcakes, and other baked goodies a little tricky. Keep these tricks in mind for your next round of baking. Over-baking is the primary cause of stubborn muffins, even with a greased pan. Pay close attention to your baking times and use your kitchen timer for every batch. You can test a single muffin or two to find the perfect time for your oven. Be sure to fill the empty cups with water because the uneven heat distribution can (and will) warp your muffin pan. Allow your muffins to cool for 2 to 5 minutes in the pan before trying to remove them. Any shorter and they will stick, any longer and they will begin to get mushy. Loosen muffins from the side of the cup by running a butter knife carefully around the edges. If you absolutely cannot get a muffin out of a hot tin, place the pan on a wet towel for about 2 minutes. They should pop right out afterward.